Training and Conferences - D.M.A.T. Networks, exchange of experience and information are counted for the D.M.A.T. Consulting KG as an essential task as a company in the crisis and disaster area at the latest level of technology, developments and especially the needs of those affected, as well as emergency services. Read more about the trainings and conferences that D.M.A.T. Consulting KG participated at or organized. DECATASTROPHIZE, this project name refers to : the use of SDSS and MCDA to prepare for disasters or plan for multiple hazards, so that the use of SDSS and MCDA is to be prepared for disasters and multiple dangers. On the 4th of December 2017 a basic information about the DECAT project took place in Paphos, Cyprus. Afterwards a plan exercise was carried out and the results were presented. As part of the exercise, a decision was made by the competent authority representatives depending on the situation development, use of the databases are reached and implemented in the appropriate maps as a situation image. The following day was dedicated to the final presentation of the DECAT project. DMAT Consulting KG held a lecture on floods, forest fires and early warning systems in the course of the final day and reported on procedures and experiences at European, national and municipal level, experiences presented by the city of Graz. The DMAT Consulting KG was invited to present at a joint workshop of the projects EPISECC and COncORDE on September 11th in the DG Home in Brussels.The organized workshop focused on the topic of optimizing real-time information exchange in emergency and disaster management. DMAT spoke about the perspectives of end users. within the EU Civil Protection Mechanism was Prof. Dr. Alois Hirschmugl from D.M.A.T. Consulting KG a trainer, for the 28th time on the Assessment Mission Course for a training course for explorations after disasters. 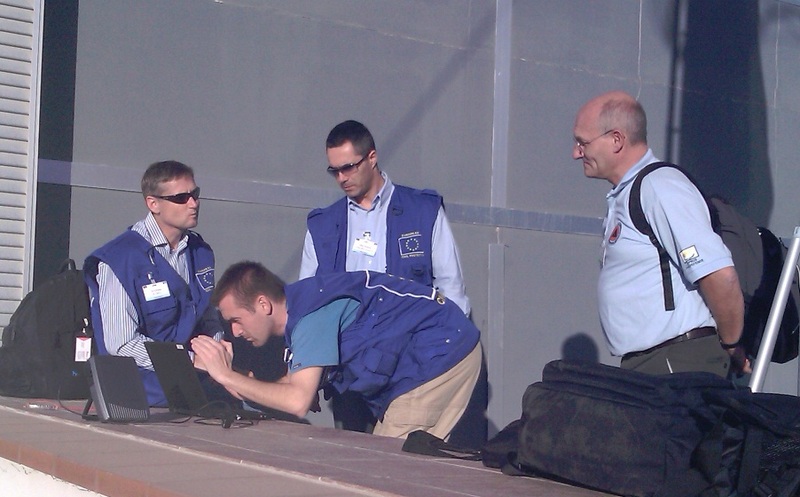 In addition to planning explorations and conducting interviews with decision-makers in disasters, the latest analysis and assistive technologies for reconnaissance missions were also presented and trained with them for emergencies. On November 9th a symposium was held at Graz Airport by the Austrian Society for Ethics and Law in Emergency and Disaster Medicine (ÖGERN). The legal and ethical aspects during major accidents and disasters and in special danger situations were discussed and an overview of international coordination mechanisms was given. Here you will find a link in German to the conference volume “Major accident-catastrophe-special-danger situation”. The fourth volume of the conference summarizes the speeches given by the speakers on issues such as head of command, preclinical and in-hospital planning, and numerous other topics relevant to the topic. On the 23rd calendar week, an international civil protection exercise of the ModEx 2015-2016, as part of the United Nations Civil Protection Mechanism took place in Wiener Neustadt. The exercise in the Tritolwerke in Lower Austria, in which teams from Bulgaria, Finland, Italy, Slovenia and the Czech Republic participated, is the third and final training session of the EU Module Exercises 2015-2016. The D.M.A.T. Consulting KG supported some of the intervention teams in the exercise in dealing with the newly developed technologies in the framework of the Spartacus project. A work group consisting of the Johanniter-Unfall-Hilfe e.V., the Austrian Ministry of the Interior, the Crisis Managemnt Center (CMC) of Finland, the Danish Emergency Management Agency and the Italian Civil Protection Department, designed and held the EU Module Exercises 2015-2016. Since the Civil Protection Training of the European Union began, the D.M.A.T. involved in various courses as a lecturer, as a trainer or as a training supervisor. Currently, D.M.AT Consulting KG is engaged in the (Assessment Mission Course, AMC) in Bulgaria and Cyprus, as well as in (International Coordination Courses,ICC) in Denmark and Germany with supporting activities. A Group picture of the Cypriot Red Cross at the Assessment Mission Course in Cyprus. On September 4th, a meeting of the Advisory Group the publisher of the Crisis Response Journal took place in London. Specifically, the Crisis Response Journal reports on and reports on man-made natural disasters, as well as on disaster risk reduction, citizens’ resilience, stakeholders and operational forces, operational continuity and security. In addition to discussing the strategy of the next two years, the D.M.A.T. Consulting KG proposed to report on FP7 and Horizon 2020 projects such as SPARTACUS. The innovation of these projects is aimed above all at protecting and rescuing the population and the environment at the event of a disaster. The more widespread the software is, the more data can be used in crisis situations through the crowd applications for a quick and effective use to help. The next issue of the Crisis Response Journal addresses is the use of military assets in disaster relief at national, regional and international levels. In four days, on November 29th 2013, a workshop on “Sudden Blackout” will take place in the Austrian Interior ministry .The workshop organized by the Systemic Foresight Institute is not just for companies that like the D.M.A.T. Consulting KG with solutions for crisis and disaster cases, it is important because a blackout affects us all! Planning and development in the event of a catastrophic breakdown of supply lines, of technical supply lines is essential in order to maintain safety and minimize risks. The following speakers had a speech on this exciting topic for the international disaster management of the United Nations: Mr. Herbert Saurugg, the initiator of the workshop, Mr. Robert Stockner from the Interior Ministry, Kurt Misak from Austrian Power Grid AG, Harald Besenböck from A1 Telekom Austrian AG, Brigadier Alois Hirschmugl. Following the keynote presentations, an interactive moderated workshop is planned to prepare for a Europe-wide power failure. The upcoming workshop is expected with great interest. Three times a year, the European Union’s Assessment Mission Course takes place in Cyprus. The purpose of these missions is to train civil defense experts for real missions. Cyprus is well-suited to these training sessions in the EU, as a variety of disaster scenarios can be practiced. In addition, the exercises are attended by decision makers and security experts from real companies, whereby the practice assignments are based on current standards and circumstances. In addition to the ideal conditions for the exploration courses, they also provide a good opportunity to build networks and cooperation with members from other participating countries of European civil protection. Dr. Alois Hirschmugl from D.M.A.T. Consulting KG observed and supported the participants of the exploration course in Cyprus. 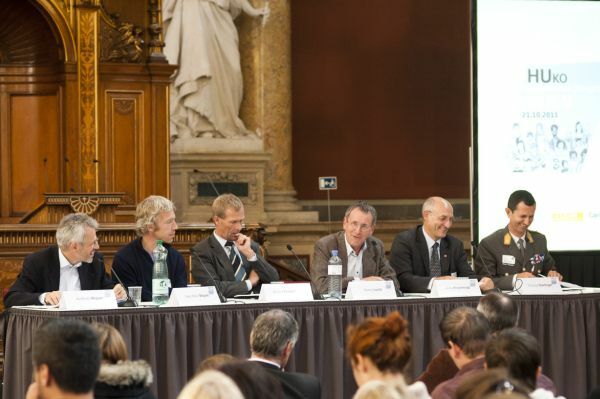 On October 21st 2011, the first humanitarian congress took place at the University of Vienna. More than 40 international experts from various disciplines and organizations, such as the Red Cross, World Vision, the Austrian Federal Army and others, were invited to the panel discussion to share their experiences and discuss the development of humanitarian aid. Panel discussion at the first humanitarian congress in Vienna. Dr. Alois Hirschmugl, second from right. Between the 28th and 30th of March 2011, the 8th Dubai International Humanitarian Aid & Development Conference & Exhibition took place in Dubai, United Arab Emirates. The topic of the 8th Humanitarian Aid and Development Conference and Exhibition deals with “New Technologies”: How do they Impact Humanitarian Operations and Developments?”. Unfortunately, the program for the 8th DIHAD is no longer available online. Read more about the 15th DIHAD, 5th – 7th of March 2018. An initial workshop on “Education for Peace” took place on March 12th, 2010 in Graz. This was a joint imitative by The Styrian Provincial Government and the Humanitarian World Forum in Geneva with the implementation which the company miraconsult e.U. instructed. The aim of the project is on the one hand, the exchange of information and discussion on the subject, as well as the development of projects in interdisciplinary small groups. Four of the projects developed here are to be implemented in the coming year. Read more about this exciting and for all of us very important theme “Education for Peace”.